Every year, we put together a collective Thanksgiving dinner menu, where each member of my family contributes one or more dishes. Every year, I get stuck with the vegetable. I guess it’s only fitting to ask the health-absorbed foodie in the family to supply the dose of nutrients in this indulgent feast, but most of the time, my dishes don’t stand a chance next to the praline topped sweet potato casserole, or the unbelievably decadent baked corn. I can’t really blame people for bypassing the greens in order to make room for more stuffing; however, I’m always aiming to change the minds of my skeptical family members by coming up with an elaborate side dish that makes the cut. This year, I focused on one of the most seasonal vegetables on the market this time of year, Brussels sprouts. In the past, these little bushels have taken some criticism on taste; however, I’ve found that most of the time, it is because the preparation has been all wrong. Roasting sprouts is clearly the way to go when it comes to making this veggie, and taking it one step further by adding in a few extra touches is the key in making a boring side come to life. Thankfully, the sprouts were a hit among this year, but I would be lying if I said they triumphed over the sweet potato casserole. It was close, but in the end, cinnamon whipped sweet potatoes topped with caramel praline crunch always wins. 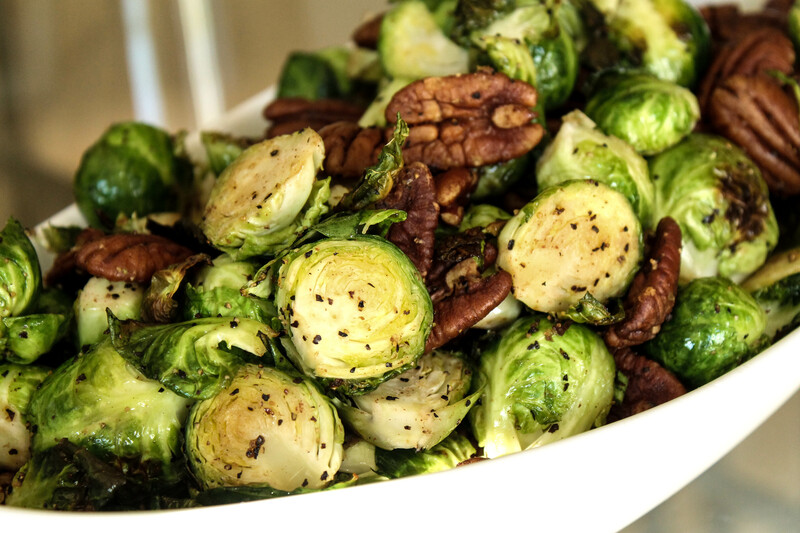 In a large bowl, combine Brussels sprouts and 1 tablespoon of the melted butter.. Sprinkle with sea salt. Lay on a foil-lined baking sheet coated with cooking spray. Bake at 450 degrees for 15 minutes. In a separate bowl, combine the pecans with the reserved melted butter and vanilla. Season with salt. Remove the sprouts from the oven and place them in the bowl with the pecans. Add the maple syrup and toss to combine. Lay the sprouts and pecans back on the baking sheet. Roast for an additional 5 minutes.